Earlier today, Mar. 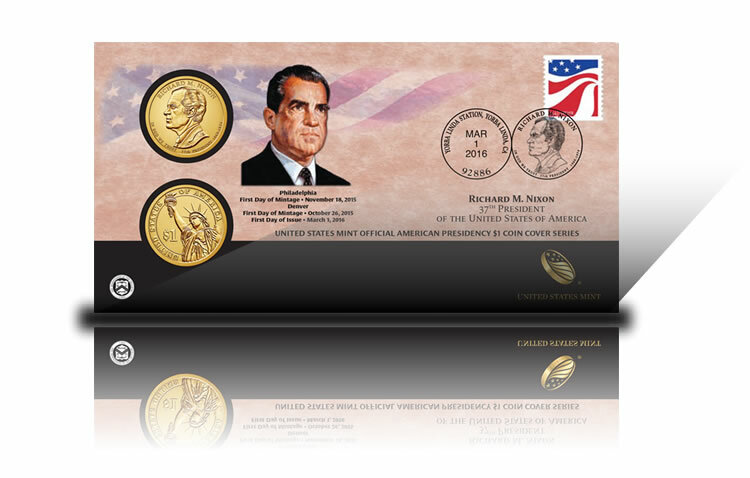 1, the United States Mint released a new coin cover that includes two circulating-quality dollars featuring Richard M. Nixon. 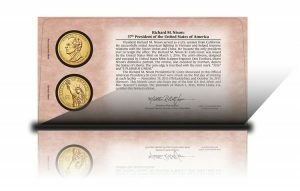 For $19.95 each and limited to 20,000 units, this latest collectible marks the 37th release in the American Presidency $1 Coin Cover Series and the first of three for 2016. The coins for these covers are unique in that each one is a first-day production strike. The dollar from the U.S. Mint facility in Denver was made on Oct. 26, 2015, and the dollar from the facility in Philadelphia was produced on Nov. 18, 2015. A protective display card houses both coins, with the front side of the card featuring a portrait of the president and a postmark stating, "YORBA LINDA STATION, YORBA LINDA, CA," and "MAR 1 2016," which represents the city where Richard Nixon was born and the day of the coin cover’s release. On the back of the card is information about Nixon, the dollars, and the product itself. Each display card comes inside an envelope bearing a Red, White, and Blue Forever® postage stamp. 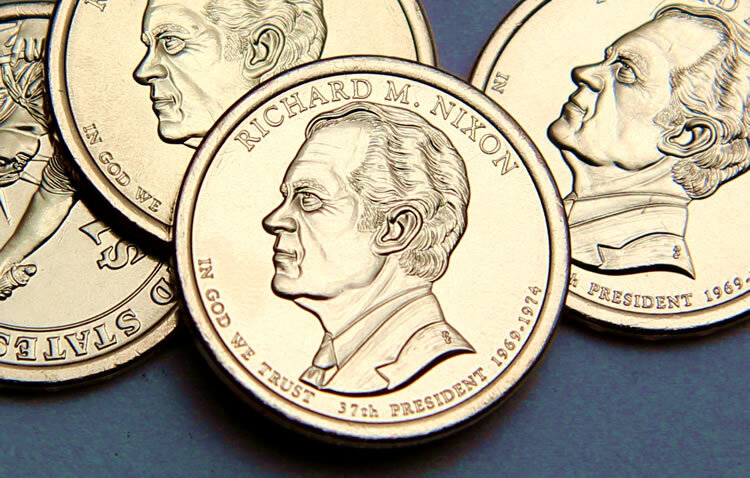 Designed and sculpted by Don Everhart, obverses or "heads side" of the $1 coin offer a likeness of Nixon, surrounded by inscriptions that read: RICHARD M. NIXON, IN GOD WE TRUST, 37th PRESIDENT and 1969-1974 for the years he served as commander-in-chief. All Presidential $1 Coins have common reverse or "tails side" designs that bear Everhart’s rendition of the Statue of Liberty. Inscriptions around Lady Liberty include: UNITED STATES OF AMERICA and $1. Dollar coins also share edge lettering stating their year of issue, the ‘P’ or ‘D’ mint mark for the mint of origin, and E PLURIBUS UNUM. American Presidency $1 Coin Covers are found on the U.S. Mint’s website page, located here. Phone orders are accepted at 1-800-USA-MINT (872-6468). Notably, this year marks the end of the series. The last two covers include dollars featuring Gerald Ford and Ronald Reagan. The one for Ford is estimated to launch in April while the one for Reagan has a sale date in August. Also, many of the previously released coin covers remain available. They have sales ranging from 11,945 to 23,677. As an aside, limits for last year’s covers are different. The Kennedy $1 Coin Cover has a higher limit of 35,000 units while the others for Truman, Eisenhower and Johnson are each held at 15,000. Thank you, Rhonda and Seth for your informative posts!! !